Track any changes to your Amazon products including titles, images, hijackers and reviews. 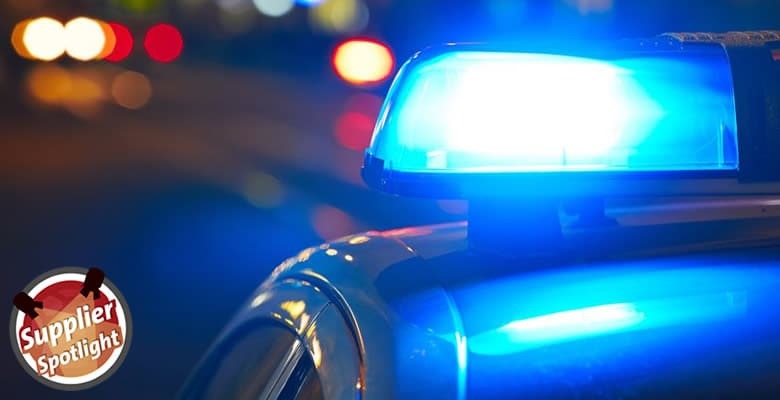 Alerts are sent within minutes of being targeted. Sabotage from other sellers is a big problem on Amazon. For many sellers, their competitors are constantly trying to jump on their listings, submitting fake reviews and trying to interfere with their product details. It’s essential to continually monitor your Amazon products, but doing that manually is resource-intensive and exhausting. AMZAlert is a specialized, automated tool for monitoring Amazon listings. It continually scans your products and lets you know if there’s a problem. This saves hours every week, and gives peace of mind that if one of your ASINs is under attack you will know about it fast. 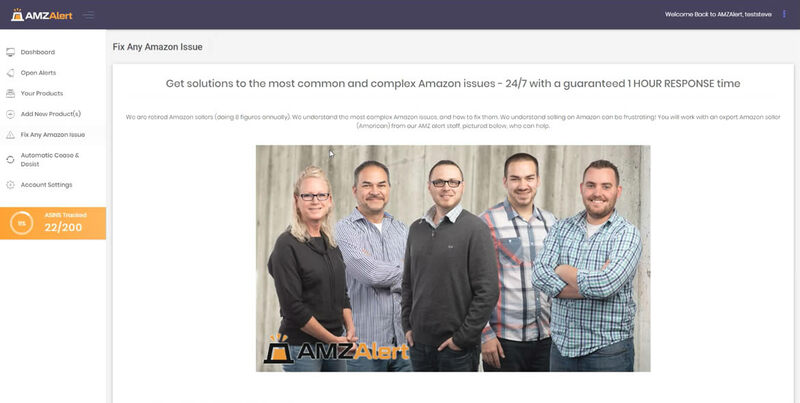 In this post, we’ll walk you through the AMZAlert software and let you know how it works, so you can focus your efforts on growing your Amazon seller business, not on watching out for competitors. We’ve covered AMZAlert before, but it’s helpful to get a quick reminder on what the software does. 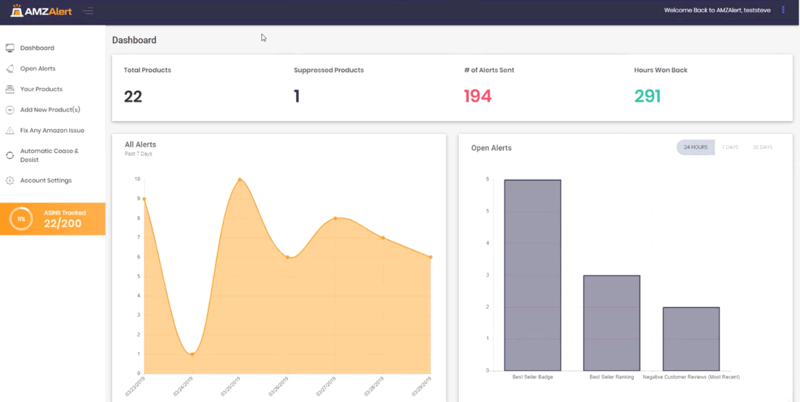 AMZAlert automatically monitors your products, crawling your ASINs every 15 minutes. If it notices changes in how your product is shown on Amazon.com, it will send you an alert by text message or email. You can choose to monitor many different aspects of your products including title, image, bullets, description, BSR, reviews, category, search ranking, Buy Box ownership and more. If any of these change, AMZAlert logs what happened and sends you an alert. Automated crawling and monitoring of Amazon product pages, so you don’t have to check for changes manually. Fast notifications of potential problems caused by competitors or Amazon itself, so you can take immediate action. Easy management of alerts through a “Work List” and customized notifications. Advice to help you resolve difficult issues with Amazon product listings. Ultimately, AMZAlert is designed to help you make the most of your time, by monitoring and alerting you to any issues, and making it easier to troubleshoot problems when they happen. After signing up for AMZAlert (there’s a free ten-day trial available), the first thing you see is the dashboard. This gives you an overview of your Amazon account and the products you’re tracking through the software. The total number of ASINs you’re monitoring. The number of “suppressed” products – items that are not currently visible on Amazon. The total number of alerts sent. An estimate of the number of hours saved by using AMZAlert. Below that you’ll find an “All Alerts” graph showing the number of alerts each day over the last week. There’s also an “Open Alerts” graph which lets you see the types of alerts on your product listings over the last 24 hours, seven days, and 30 days. Scroll down a little further, and you’ll see your ten most recent alerts, so you can see the latest potential problems at a glance. Below the dashboard, you’ll find the work list. This lets you manage open alerts on your account so you can take action to resolve them. You can easily add alerts from your dashboard and other areas of AMZAlert to the work list. Once you’ve done that, it makes it easy to go through all the items and take whatever action you need to address the problem and restore your product listing on Amazon. You can sort the work list by priority and change the urgency of individual items. Once action has been taken, you can mark alerts as complete and leave notes and comments to say what was done. Track all the alerts that are coming in. Filter alerts according to the criteria you set, so you can drill down into the detail and find trends. Sort alerts so you can focus on the most urgent issues. Download the data into a spreadsheet for external analysis, monitoring, and actions. The open alerts page gives you plenty of information to help you troubleshoot problems. You can add the products manually, one at a time. You can use the batch import wizard to upload a CSV with the relevant product details. If you want to load all of your Amazon products quickly, it’s just a case of requesting a report from Seller Central, and copying the relevant products into the AMZAlert import CSV. 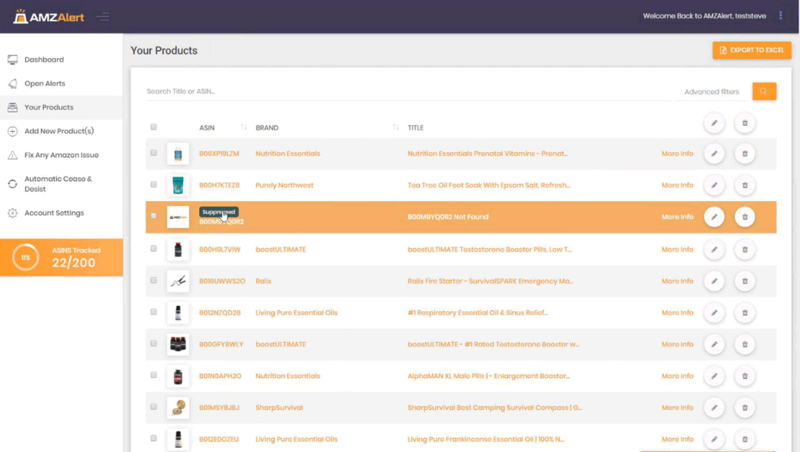 Once your products are in AMZAlert, you can view all of them from this part of the tool. 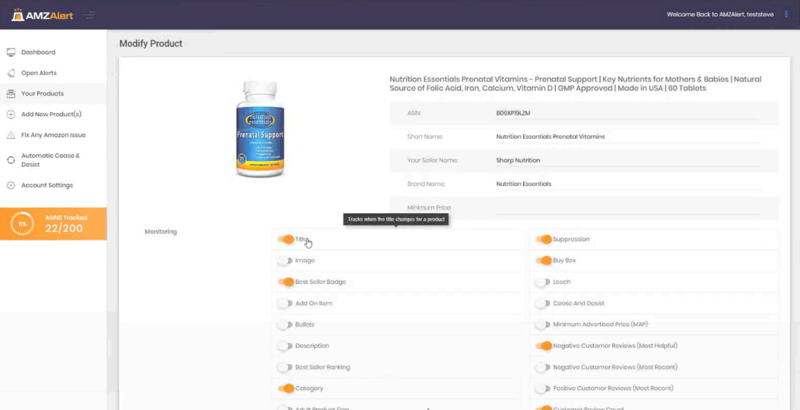 The list view shows the main details for each product. If items have a “suppressed” label next to them, it means they are not showing on Amazon and customers can’t find that product. You should prioritize those items for troubleshooting. Click on “More info” next to any product to get further details including the ASIN, main image, crawl history, and more. You can also view an HTML snapshot of exactly how the product appeared on Amazon at that time. This part of the tool lets you modify exactly how each item is monitored and set criteria on when you want to be alerted. You have granular control over what’s monitored, including areas such as title, image, Best Seller badge, bullets, description, BSR, reviews, category, keyword rank, Buy Box ownership and more. You can also choose to be notified by email, SMS, or just within your AMZAlert account. One exciting area of AMZAlert is the ability to automatically create and send “cease and desist” letters when another seller tries to compromise your listings. A seller might damage your sales by asking Amazon support to change the title or other details of your product, by selling their own product under your listing, or through other means. This feature was available in the past and very successful, but due to changes made by Amazon it is currently back under development. When it’s ready AMZAlert will be able to send automated cease and desist letters to sellers who are exploiting your listings. You can easily set up multiple users and customize which alert types are sent to which email addresses. By sending notifications directly to the people best equipped to deal with them, you can make problem resolution quicker and easier. You can also whitelist specific sellers in your AMZAlert account, who you have authorized to sell your products on Amazon. By whitelisting them, you won’t get alerts on their activities and then have to filter them out manually. The team at AMZAlert are experienced Amazon sellers, and can assist with issues that you’re likely to run into. They provide an online advice service called “Fix Any Amazon Issue” for a fixed cost of $99 per month. It’s an optional add-on to the AMZAlert software and can provide very valuable advice for dealing with the issues you are alerted to. AMZAlert is an easy to use tool that could save you hours every week. The recent upgrade to version two of the software means it has many more useful features. There’s a ten-day free trial with no credit card required and no need to link your Amazon account, so you can test it out for yourself with nothing to lose. AMZAlert also provides live demos so you can see this walkthrough in real-time and ask any questions you have about how the system works. If you’ve ever experienced the pain of competitors abusing and exploiting your listings, you’ll really value the peace of mind and fast issue detection that AMZAlert provides. This post was sponsored by AMZAlert.